1. Older people still prefer receiving direct mail over other marketing methods. And, according to the DMA (now the Association of National Advertisers in the U.S.), cited by Ballantine, the response rate for direct mail is 3.7% compared with 2% for mobile, 1% for e-mail, 1% for social media and 0.2% for Internet display1. 2. There are more older Canadians. The percentage will keep on growing for quite some time. The 2016 census data from Statistics Canada, reported by CBC News, shows that there are 5.9 million seniors in Canada2. 3. Baby Boomers are the most generous donors. The average amounts donated increase with age, where individuals in the 65-plus category give on average $715 annually and those 75-plus donate $726 annually, according to Statistics Canada3. For the next 10 to 20 years, direct mail will continue to become an increasingly important fundraising tool for non-profits. I not only teach direct marketing at colleges, but I practice it too and I still see my best returns via traditional direct mail marketing. I’ve been helping non-profits for the last 18 years. Based on my experience with hundreds of campaigns, and ten years of interviewing people in our industry for DM Magazine, I know how to tell stories. 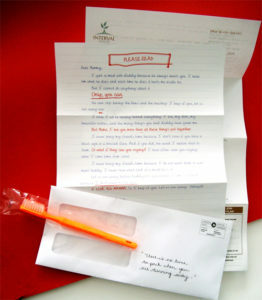 First and foremost: give your readers a reason to send money. Tell them a story, no not your organization’s story, but one that connects with donors. Principle 1: Simplify your stories. How do we find the essential core of our ideas? Statistics don’t work as well as one compelling fact. Like Yannick’s story for United Way of Montreal, a high school dropout, who learned to read and write just so that he could read bedtime stories to his daughter. Principle 2: Tell your stories with one clear objective. Make sure you explain your idea in terms of human actions and sensory information. This is where so much communication goes awry. Mission statements, synergies, strategies, and visions are too ambiguous to the point of being meaningless. Sticky ideas on the other hand are full of concrete images—ice-filled bathtubs, apples with razors—because our brains are wired to remember concrete facts. Proverbs are an excellent example because these abstract truths are often encoded in concrete language, like “A bird in hand is worth two in the bush.” Speaking concretely is the only way to ensure that our ideas will mean the same things to everyone in our audience. 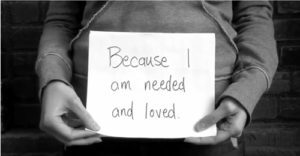 This Interval House’s daughter’s plea to her mother who cannot understand why her mother continues to live with her father in an abusive relationship, is a perfect example. Principle 3: Tell stories that are credible. How do we make people believe? By allowing people to test your ideas for themselves. One of my favorites is the “Don’t Mess with Texas” anti-littering campaign. While all statistical facts and warm and cuddly appeals to stop litter had failed in Texas, this simple, message—which had a toughness that appealed to conservative rednecks, not just liberal tree-huggers—quickly became a favourite bumper sticker. More to the point it was known and could be recalled by 73% of Texans just a few months after the campaign was launched, and roadside litter declined in Texas by nearly 30% within a year4. Principle 4: Tell emotional stories. How do we get people to care about our ideas? We make them feel something. Research shows that people are more likely to make a charitable gift to a single needy individual than to an entire impoverished region. We are wired to feel things for people, not for abstractions. This Heart House letter revolved around a simple faded rose that symbolized the love of one partner for his dying wife is a perfect example. Principle 5: Tell inspirational stories. How do we get people to act on our ideas? Tell stories that touch people. 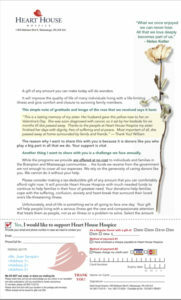 Inspirational stories can act as stimulators, to help donors to respond more quickly and effectively. 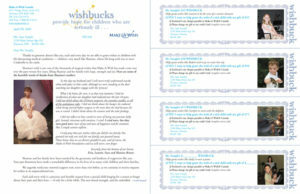 Like this Make-A-Wish Foundation letter that prompted people to grant a terminally ill child her wish. Principle 6: Use multiple channels. If you work it right, social media can be the foundation for a killer storytelling campaign. It allows you to not only reach your donors through multiple platforms, but it also really pulls your audience in. Remember, exchanges happen constantly on social media that don’t happen anywhere else, and those exchanges could be between you and your donors, their friends and new supporters. Case in point is The Lisa Brown Charitable Foundation, which my students created a video campaign for. Here is the link: https://youtu.be/GAohZup-ZXc. This video not only helped the small charity raise more money than ever before, but it was so successful that Sick Kids Hospital saw the video and approached the charity and offered to make The Lisa Brown Charitable Foundation a part of their organization. Now, that’s success. Billy Sharma is owner of BKS Creative Services, which provides creative services (copy and design) to the fundraising community. He also teaches direct marketing at Seneca College in Markham, Ontario as part of its advertising programme. 1 Ballantine, “Ultimate Guide To 2016 Online & Direct Marketing Statistics”, September 30, 2016. 2 Eric Grenier, “Canadian seniors now outnumber children for 1st time, 2016 census shows”, CBC News, May 3, 2017. 3 Statistics Canada, “General Social Survey on Giving, Volunteering and Participating”, 2013. 4 The Goodman Center, “Don’t Mess With Texas”, Free-Range Thinking, blog, February 2000.